Semtech Corporation(Nasdaq:SMTC), a leading supplier of analog and mixed-signal semiconductors, today announced it is shipping two new, compatible evaluation modules (EVMs) for prototyping and developing wireless charging solutions for wearable applications. The Semtech TSWITX-G4-EVM is an evaluation platform for the test and experimentation of a wireless charging transmitter based on the Semtech TS80002 Wireless Power Transmitter Controller and TS51231 Driver. This evaluation module, in conjunction with its compatible receiver, the TSWIRX-5V2-EVM, provides a complete system design solution for low-power, wearable applications. The TSWITX-G4-EVM Evaluation Module is a ready-to-use demonstration platform allowing testing of 1.25 watt of wireless power transmission. The transmitter is coupled with its compatible receiver module, the Semtech TSWIRX-5V2-EVM, to form a complete wireless power transmission system. TSWIRX-5V2-EVM is a ready-to-use demonstration platform supporting 5V output with up to 250mA for low-power and small form factor wearable applications at an operating frequency of 1MHz. 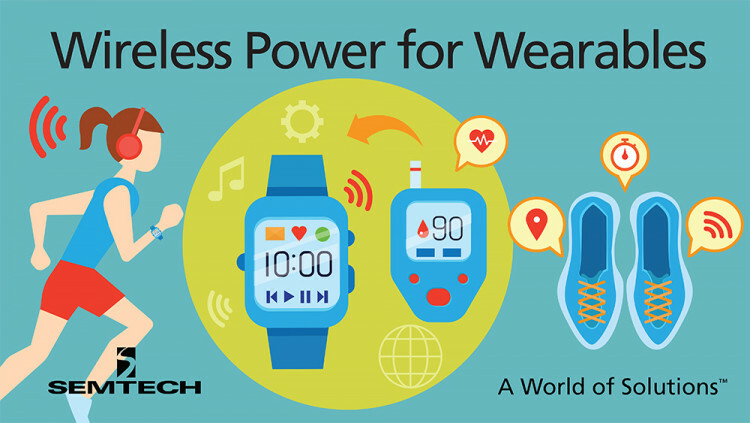 Semtech’s robust portfolio of wireless power ICs vary in size, features and specifications for easy implementation into a wide range of applications, including high-power industrial equipment and commercial infrastructure, medium-power portable devices and phones, low-power wearables and more. Semtech wireless power products support the major industry standards to ensure interoperability with all wireless charging-enabled devices. Stop by Semtech’s booth at Electronica, Hall A4 booth 516, to see wireless charging products. Subscribe to Semtech’s e-newsletter Inside Circuit for quarterly product updates. The TSWIRX-5V2-EVM and TSWIRX-G4-EVMs can be purchased through Semtech’s distribution channels. For additional information, visit www.semtech.com/info. All statements contained herein that are not statements of historical fact, including statements that use the words “to develop,” or other similar words or expressions, that describe Semtech Corporation’s or its management’s future plans, objectives or goals are “forward-looking statements” and are made pursuant to the Safe-Harbor provisions of the Private Securities Litigation Reform Act of 1995, as amended. Such forward-looking statements involve known and unknown risks, uncertainties and other factors that could cause the actual results of Semtech Corporation to be materially different from the historical results and/or from any future results or outcomes expressed or implied by such forward-looking statements. Such factors are further addressed in Semtech Corporation’s annual and quarterly reports, and in other documents or reports, filed with the Securities and Exchange Commission (www.sec.gov) including, without limitation, information under the captions “Management's Discussion and Analysis of Financial Condition and Results of Operations” and “Risk Factors.” Semtech Corporation assumes no obligation to update any forward-looking statements in order to reflect events or circumstances that may arise after the date of this release, except as required by law.